Glass!!! I love it. What more can I say? Kathy Nelson was born in Pennsylvania and lived in many parts of the United States before settling permanently in north Scottsdale in 1988. A long standing fascination with the texture, color and durability of glass fueled her interest in that medium. Her visits to European cathedrals emphasized the beauty of glass. She started working in glass as a hobby about 8 years ago. Initially, she was attracted to stained glass. 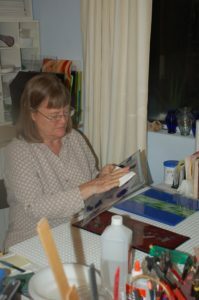 However, after taking a couple of fused glass classes she switched from stained glass to fused glass, and has continued in that art, learning and teaching for almost a decade.